Serving Nassau County for over 50 years! Below: Arthur M. Lewis' store, located on Mineola Blvd from 1963-1992. We serve the neighboring communities of Mineola, Garden City, Albertson, Williston Park, Herricks, Franklin Square, Westbury, Carle Place, East Williston, Searingtown, and Manhasset. After serving his country in the United States Navy, dedicated musician Arthus Lewis learned the art of brass and woodwind repair at the C.G. Conn Factory. 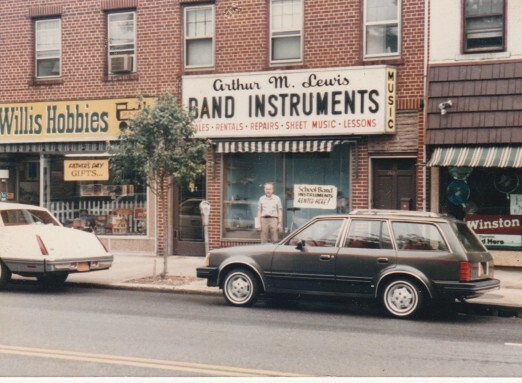 He founded Arthur M. Lewis Band Instruments in Mineola in 1950. The store is now run by Arthur's son, Brian Lewis! 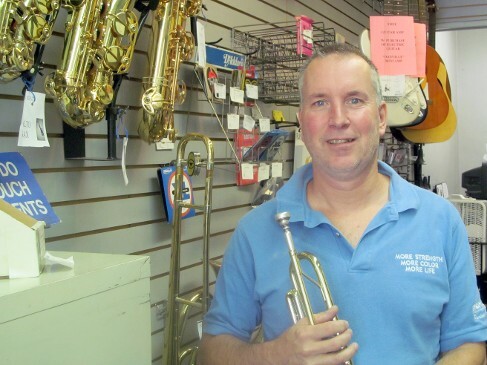 Having acquired the family business in 1989, Brian modernized the the store while still providing Lewis Music's personal, courteous, prompt service. 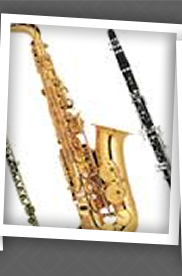 Brian personally repairs your brass and woodwind instruments. Brian Lewis is a professional trumpet player and can be heard with his "New Vintage" Orchestra & CONGA Tribute Band throughout Long Island and the tri-state area. His group also provides school clinics and jazz workshops. Brian Lewis never planned it, but he maintains a legacy of more than 50 years in business at Lewis Music in Mineola, a legacy inherited from his late father, Arthur. Brian was studying for a bachelors degree in music education at Queens College when his father was diagnosed with Alzheimers disease in 1986. His mother was also ill and he started helping his father in the music business he had opened in the early 1950s. Lewis, 52, recalled that he faced a tough decision after graduating college: accept a full-time teaching position in the Syosset School District or continue working in the family business. He ultimately apprenticed repairing instruments under his father’s tutelage and took over the business in 1989 as he taught part-time in the Syosset district. “I do love teaching and I could have done that,” Lewis said during a conversation in his store this week. The business isn’t the only legacy that his father gave him. Arthur played saxophone and his two sons, both influenced by their father’s love of music, both became accomplished professional trumpet players. Brian remembers his father regularly blaring classic big band music every Sunday in their Dix Hills home—music that he and his brother Michael absorbed. “I just remember hearing that all the time growing up. He had the passion for music,” Lewis said. Brian Lewis has also found a way to pass on his own passion for music. 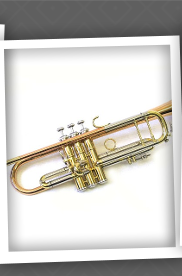 One day in 1990, a friend of his father who taught music at Chaminade High School, called Brian to ask if he was interested in teaching trumpet part-time to replace a staff member who had suffered a stroke. 93310596Lewis said yes, beginning a relationship that continues today as he prepares to teach band lessons at Chaminade each morning again this fall while also continuing to teach trumpet there. “I like to do it. The kids are great. I like to be involved in every facet of the music business,” Lewis said. As leader of his own group, the New Vintage Orchestra, since 1992, he is also a seasoned performer along with his wife, Doris Anne Lewis, who is one of two featured singers with the orchestra. “We made a decision to put a band together so we could work together,” he said. New Vintage has backed noted crooners such as The Temptations, Jerry Vale, Al Martino, Connie Francis and Frankie Valli. New Vintage Orchestra performs 1930s and ’40s classics using original arrangements from Benny Goodman, Glenn Miller, and Harry James, and arrangements written by Brian. The group also covers tunes of contemporary swing bands, including Cherry Poppin’ Daddies, The Brian Setzer Orchestra and Big Bad Voodoo Daddy. He and his wife are currently planning a tribute band to play the music of Gloria Estefan and the Miami Sound Machine, music they’ve been playing at weddings for years. Performance venues for the orchestra are more difficult to find these days and the popularity of big band music has waned in the wake of a swing music revival in the ’90s. New Vintage released a CD several years ago, Standards Aged to Perfection, featuring “And the Angels Sing” and “Sing Sing Sing” among other classics. 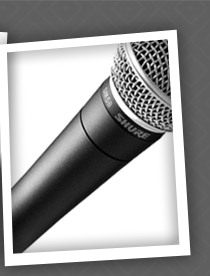 Lewis said then Sinatra tunes the group plays behind vocalist Ron D’Abruzzo, help to draw bookings these days. “The generation that appreciated big band music and jazz is dissipating,” Lewis said. Lewis said maintaining the music store business primarily by offering music lessons to 125 to 150 students a week, selling and renting instruments to school districts, and continuing to repair them. 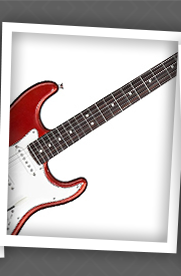 Thoughts about expanding the business were thwarted by instrument sales on the Internet, which he said affected his school business as it permanently transformed music retail sales. “Back in the old days, people did business with my father and me because they liked us,” adding that the personal service they offered inspired loyalty. Its earliest beginnings were in Arthur Lewis’s basement at the Mineola residence he lived in with his wife and children before moving to Dix Hills after Brian’s birth. Returning from U.S. Navy service during World War II in the south Pacific, Arthur learned to repair musical instruments at the C.G. Conn factory in Indiana. Arthur played saxophone in the band on his ship, the USS Orion, during the war. He also repaired instruments at Schirmer’s Music in Manhattan before starting out on his own. He opened a storefront on Willis Avenue, eventually moving to Mineola Boulevard. Brian moved the business to its present location on Jericho Turnpike in Mineola. His father died in 1995, seven years after mother, Marie, died. The Lewis’ also raised two daughters along with their two musical sons. Brian’s older brother, Michael, who has played with the Buddy Rich Big Band, still tours professionally. Occasionally, the two brothers play jobs together, as they did in an orchestra backing actor Robert Davi, in a performance of Sinatra tunes at Eisenhower Park recently. “We have a great time when we play together,” he said. Each Christmas, Brian, his wife and their three daughters perform at a nursing home in Old Bethpage. 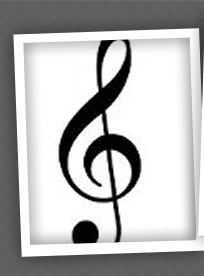 Their eldest, Jeannette, a flutist, is a junior music education major at Ithaca College. Her younger sister, Deanna, sings alto and attends Marist College. The Lewis’s youngest daughter, Amber, is a singer starting her freshman year at St. Anthony’s High School this fall. “In this family, you have to do something musical,” their father said, smiling.